Gray’s birth story really has to begin with the moment I found out I was pregnant. It was Christmas time last year and my older son, Nash, was just about 10 months old. I was feeling unusually moody and figured it was just a combination of holiday stress, sleep deprivation, and PMS. Nevertheless I opted to take a pregnancy test, you know, just to be sure. When that little screen came up “pregnant” I felt my body go numb. Of course you can’t trust the first test… so I took another; same result. 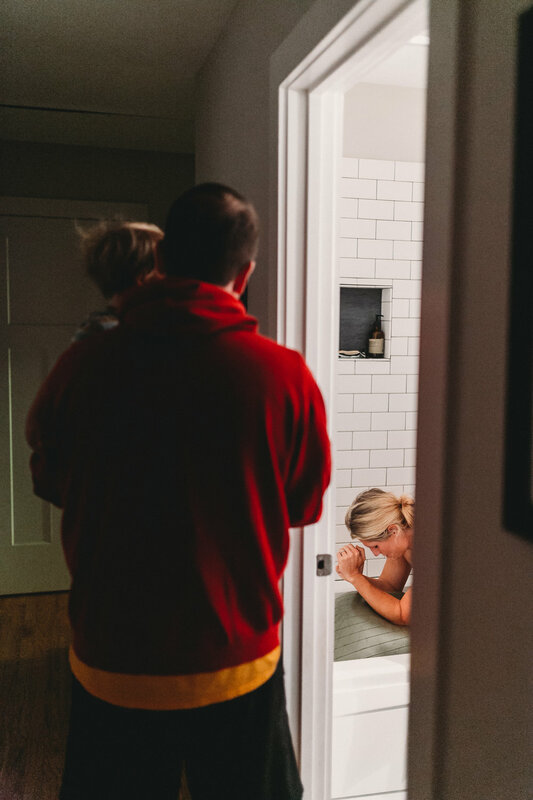 When I finally emerged from the bathroom I must have looked pretty distraught and when my husband Chad asked me what was wrong, I immediately burst into tears. It took a minute to actually verbalize “I’m pregnant” and when I did he just started laughing and came over to hug me. “It’s ok, it’s ok. It’s going to be ok” he just kept saying. I have to admit, I was really scared to tell him, and I’ll always be so thankful for his reaction because in that moment, I was feeling anything but OK.
Nash was not the easiest baby… he ate ALL the time and rarely slept. He screamed in his carseat, which made anything longer than a 10 minute drive almost unbearable. Not to mention my pregnancy with him was pretty rough (nausea until the third trimester and severe fatigue) followed by a really difficult birth experience (read that story here). 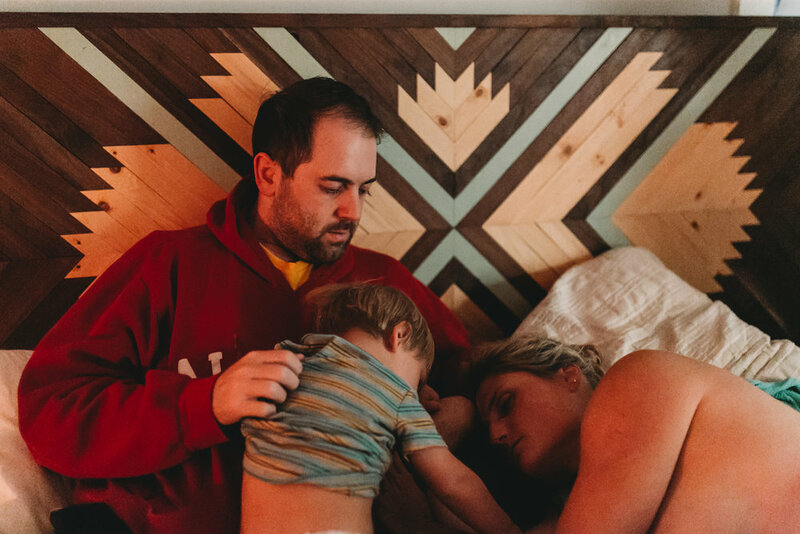 I was just starting to feel like we were getting the hang of this whole parenting thing, and I didn’t know how I’d be able to manage another pregnancy while chasing a toddler. But much to my surprise my pregnancy with Gray was an absolute joy. Aside from some slight nausea in the first trimester, I hardly knew I was pregnant. It was a completely different from beginning to end. The decision to plan for a VBAC (vaginal birth after cesarean) at home didn’t come lightly, and I was very well informed of the potential risks. I knew I wanted a vaginal birth (if possible) because the thought of having to recover from another c-section, while caring for a toddler, made my head spin. I also knew that being at home with my trusted midwife and doula team would provide the most supportive environment for me to birth. And I’m not gonna lie, there was a huge part of me that wanted redemption for a birth that was the complete opposite of what I’d planned for. The predominant risk with a VBAC (and the reason many providers do not support them) is that there is an increased chance of uterine rupture because the uterus now has a scar that could potentially make it weaker. However, a vaginal birth following a cesarean may still be a safer option for low risk women, given that the risk of uterine rupture is less than 1 percent (according to American Congress of Obstetrics and Gynecology it occurs in just 0.7%-0.9% of cases). 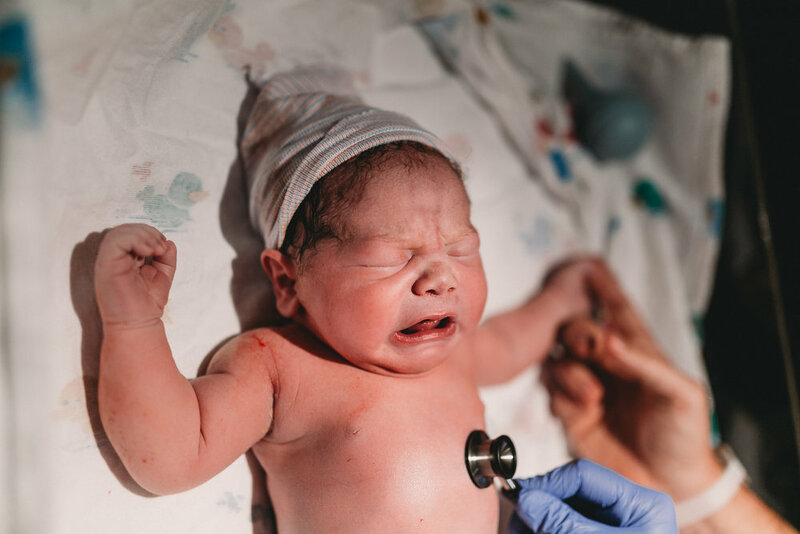 The risks associated with a repeat cesarean include: bowel and bladder damage, hemorrhage, infection, significant pain, and placental complications with future pregnancies. I was confident with my decision. Everything about Gray’s journey earth side was a surprise. From conception to birth, this precious little one kept us guessing. 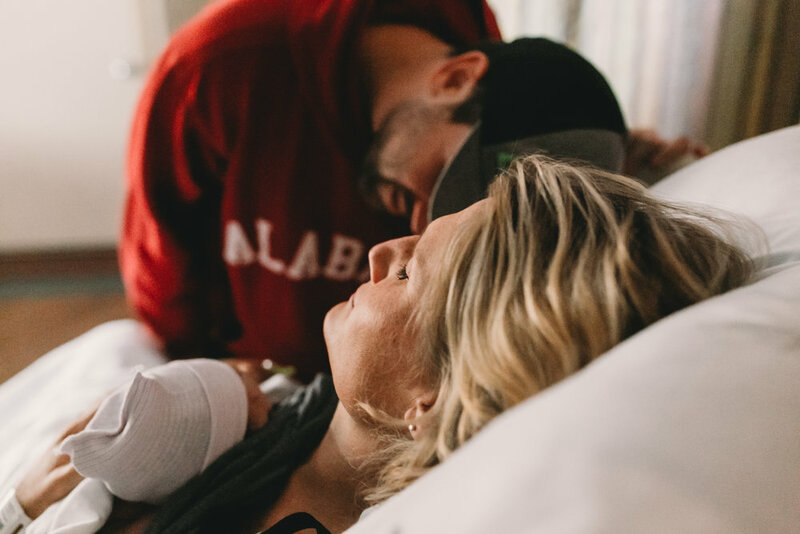 Having planned a home birth with Nash that became a hospital transfer, and eventual c-section, I prayed for a different experience, and while there were some similarities, that’s exactly what I got. On Saturday September 9th, at 41 weeks, 2 days pregnant, I began having contractions that were slightly more intense than the Braxton-Hicks I’d been experiencing for weeks. I knew my body was gearing up, but I wasn’t sure labor was going to kick in any time soon. That evening the contractions slowed significantly and I was able to get some sleep, which was wonderful considering I’d been battling pregnancy insomnia for the last month. Sunday morning the contractions kicked in again, so I touched base with my midwife. But as the day went on there was never a consistent pattern and late that afternoon she asked “when do you think this will happen?” My immediate thought was late tonight or early tomorrow, and it turns out I was right. We got in bed around 11pm Sunday night and I was pretty uncomfortable. I was able to doze off and on, but never really fell into a deep sleep. At about 3am I was startled by what felt like my pubic bone popping apart. I quickly realized my water had broken, so I woke Chad to let him know. Just as with Nash’s birth, my water breaking was the catalyst for active labor, and within moments the intensity of my contractions increased dramatically. Knowing that second babies tend to come faster, I asked Chad to start calling our team. While we waited, he rubbed my back and moved with me as I worked through each contraction. I labored as Nash slept in our bed just a few feet away. Within the hour, one by one, some of the dearest women in my life began to arrive. Each bringing her own unique, beautiful energy into our home. I remember being fully engulfed in the intensity of labor but feeling so safe and loved. Nash woke up a little after 4 and he and Chad watched as my doula and midwives lovingly helped me work through each contraction. Occasionally the boys would come over to rub my back or kiss me, and I’ll never forget how alert and affectionate Nash was throughout my labor. It was around 6am when I started to feel “pushy.” I was in shower and my team encouraged me to start making my way back to the bedroom. At one point I was on all fours, leaning over the birth ball while being checked. I was so afraid my midwife was going to tell me I wasn’t complete, but when she said she couldn’t feel any cervix left, I felt a huge sense of relief. After nearly two hours of pushing labor was starting to feel reminiscent of Nash’s birth. I remember feeling like he was “stuck” between my hips and even though I could feel that Gray was lower, the sensations were similar. I knew I was pushing effectively, but I could not get him to move down. He was stuck with the back of his head facing my left side (LOT), and he was having some trouble rotating. Later I’d find out that he’d started out completely OP meaning the back of his head was facing my tailbone, a less than ideal position for birth. In an effort to get him to rotate I pushed on my back, I pushed standing up with one leg on a stool, I pushed on the toilet… It didn’t seem to matter what position I was in, Gray stayed where he was. I remember repeating “why won’t he just come out?” and “come out baby, please come out “ over and over. Finally, just before 9 am I’d reached my breaking point. Looking back I think one of the hardest moments for me was seeing the look of concern on everyone’s faces, and experiencing a sense of de ja vu. We teach our clients that contractions are “pain with purpose” but at that point, they were not helping me birth my baby and I was suffering. I didn’t want to transfer to the hospital, but I knew I could not endure the pain any longer. Shortly thereafter, Chad loaded Nash into our car and I climbed into the back of my doulas Prius. Our midwife and photographer followed behind, and we were off. A few minutes later anesthesia came in to consent me and after he left the OB walked in. Everyone except Chad and my nurse had left the room in preparation for the epidural, and her first words after introducing herself were “your baby is not looking so good on the monitor, he’s having decels and with your history, I think we should go ahead and do another c-section.” I felt like I was in a bad dream. I knew I hadn’t been on the monitor but a few minutes, and definitely not long enough to get an accurate picture of how Gray was tolerating everything. My nurse immediately chimed in to say that I’d only been lying still and on the monitor for a couple minutes (bless her), and without hesitation I told the OB I wanted to have a vaginal birth. Once she left the room I felt angry but if ever you want to motivate me to do something, just tell me I can’t. I think in some ways I needed that encounter to snap me back into focus. FINALLY, anesthesia returned and because I was still contracting and pushing it was really challenging to place the epidural, but after several minutes I began to feel some relief. It was exactly what I needed and I have no regrets about that decision. Once the epidural was in place a new nurse took over for mine, and she ended up being such a blessing. My team came back into the room shortly thereafter and it wasn’t long before the OB returned. I could go into detail about how she repeatedly tried to bully me into another c-section, about how she picked a fight with my midwife in my room as I was trying to push out my baby, but instead I want to shift the focus to my amazing team. My nurse was kind and patient, and advocated for me in such a way that was subtle but powerful. 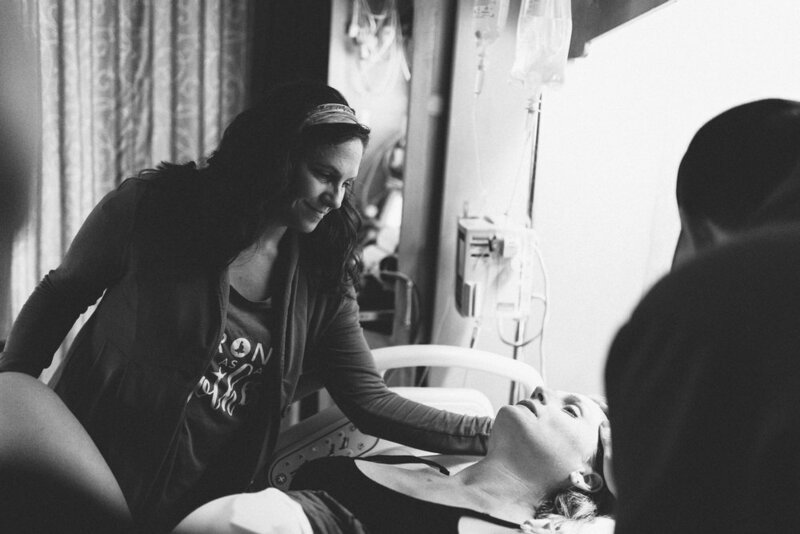 I felt so much love and support from Chad, my midwife, doula, and even our photographer. I could tell everyone of them was as invested in me pushing out this baby as I was, and I was taping into the power of their collective energy, willing me to do it. Around 11:15 I began to push and it soon became clear, to everyone (but me) that I was making progress. I’ll never forget reaching down to feel Gray’s head as he began to crown. It was all so surreal… I was actually going to have my VBAC! A few pushes later, at 11:47am, I looked down to see his head (it was huge) and body emerge and within moments my beautiful, squishy, screaming baby boy was lying on my belly. I don’t know that words will ever be able to adequately describe that experience, but the most fitting one that comes to mind is “magic.” The room felt so full of love, and joy, and pride… it was palpable. Looking around at MY people, their smiling faces and happy tears, is one of my favorite memories. After all we’d been through with Nash’s birth it felt like redemption for us all.